Fedor Novikov is co-founder and CEO at Asmbld. Petr Novikov is co-founder and head of R&D at Asmbld. In recent years, researchers and companies have been exploring new ways to improve buildings through analytics software, prefabrication, connected devices, new materials and construction automation. It’s striking that most of these efforts are trying to patch problems within the legacy framework of “permanent” construction. The assumption that buildings should be designed and constructed as permanent objects is commonly treated as an axiom. Could it be that the one thing that is taken for granted is the biggest problem with buildings as products? What’s wrong with permanent buildings? Buildings are not permanent, but we tend to think of them as such. This mental construct determines the way we design, construct, operate and regulate buildings. Just like cars or planes, buildings are complex products whose components have different service lives. In permanent buildings, all components are stitched together as if they had the same useful lifetimes. Wires, plumbing and electronics are practically buried inside walls, floors and ceilings. This makes upgrades and renovations down the road inevitably messy, time-consuming and expensive. 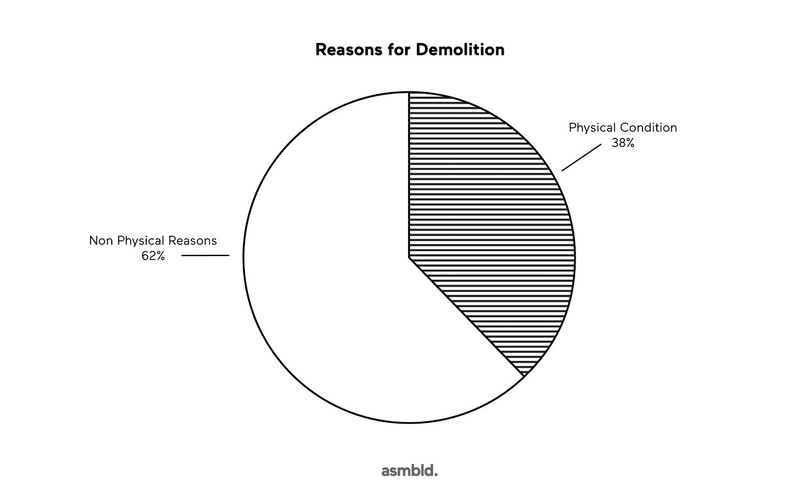 Renovations of permanent buildings require partial demolition without a possibility to fully reuse these materials or components. According to the EPA, building renovations contribute to 40 percent of all construction waste, almost just as much as the demolition itself. 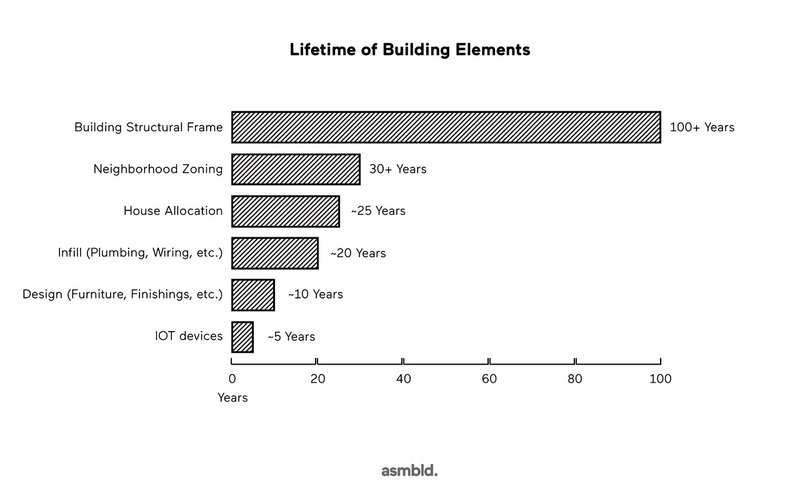 At the end-of-life, permanent buildings need to be demolished. This creates a long-term environmental problem as construction and demolition waste amounts to 30-40 percent of landfill volume (EPA). If we continue building as usual, the amount of non-recyclable demolition waste will keep increasing in perpetuity. What’s even more concerning is that, in a majority of cases, parts of buildings or even the building itself could become morally or functionally obsolete long before its physical end-of-life. During major downturns, neighborhoods of abandoned permanent buildings create additional burden on public infrastructure and may contribute to blight (Detroit is a vivid example of that). In booming periods, functionally obsolete permanent buildings constrain and slow down the pace of redevelopment and eventually require wasteful demolition. As buildings are designed to be permanent, putting new devices inside walls, floors or ceilings would require new construction interventions. Ironically, while wireless internet allows connected devices to be placed relatively anywhere, they are constrained by legacy infrastructure — location of electric wires and outlets, as well as permanent walls. Integration of smart home/office infrastructure within a permanent building framework is not future-proof. To avoid this barrier, multiple startups are making standalone devices to be placed inside of permanent buildings. Although standalone devices may have different purposes, they use lots of similar or even identical components. Nascent Objects’ analysis claims that 80 percent of home electronic devices launched since 2012 could be built from just 28 common electronic components. At room scale, it becomes redundant and wasteful, and pushes the overall system cost. In other industries, computers with programmable OS killed most standalone devices. Recently, Tesla managed to turn cars into programmable gadgets with customizable interfaces. Buildings are the next ultimate gadgets. If the end goal is to have a seamless programmable environment, the building itself should become the ultimate packaging for the IoT infrastructure, not standalone devices (just like a mainframe is hidden inside a computer or a phone). One emerging example of an integrated smart home that would run on Apple Home OS is being developed by Brookfield Residential. Ironically, such buildings may end up being outdated soon after they’re built (similarly to what happened with apartments and hotel rooms that permanently installed old iPhone docks in walls). Integration of smart home/office infrastructure within a permanent building framework is not future-proof. We’ve run into a vicious circle: obsolete permanent buildings lead to standalone devices; poor experience with standalone devices leads back to a new generation of integrated permanent buildings that would end up obsolete again. The only way to break this pattern is to make buildings modular, reconfigurable and upgradeable. It is a prerequisite for the future of a programmable built environment. Smart home and IoT infrastructure should be modular and easily upgradeable due to quicker cycles of consumer electronics and software evolution. This approach is somewhat similar to the way electronics or cars are designed and manufactured. Electronics have common standards like USB ports or proprietary standards like Apple Lightning connectors that remain unchanged throughout the generation of the products. This makes it possible to upgrade a small share of components in newer models and initiate trade-in programs aimed at refurbishing and reusing components with longer, useful lives. One important constraint in the transition toward reusable and reconfigurable buildings, it appears, would be cultural, rather than purely technological. Japanese large-scale prefabrication companies pioneered the approach to buildings as upgradeable gadgets several decades ago. According to Linner and Bock, the focus in the Japanese prefabrication industry is shifting to “service design” related to the building’s life cycle. For example, companies like Sekisui House keep track of all components’ service lives and proactively conduct maintenance and upgrade work similar to the way most cars are serviced. Toyota Housing provides building and apartment layout reconfiguration services. Sekisui House goes as far as to provide trade-in programs for used buildings in exchange for newer constructions. Japan has demonstrated to the world that modular building can be of very high quality, and serviced as industrial gadgets. Elsewhere in the world this approach has not gotten much traction. In the United States, a couple of organizations are already working toward improving building reusability, modularity and reconfiguration. Open Building Institute started a campaign for modular reconfigurable building kits a few days ago. OBI standardizes building blocks to allow building reconfiguration over the structure’s lifetime. At the moment it’s a DIY system somewhat similar to WikiHouse, but with higher integration utilizing off-the-shelf building materials. KASITA, an Austin-based startup, is working on standardized micro-living pods that could be easily transported to different locations and even involve entire cities. KASITA also introduced a modular interior wall system that allows users to personalize it and upgrade it over time. However, the pods themselves are not reconfigurable. In commercial buildings, Google presented a vision for their reconfigurable campus based on the realization that the company had no idea how it would evolve organizationally in the next 10-20 years. Thus, they envisioned a campus that could be flexible enough to adapt to whatever the future holds. Reusability and upgradeability of buildings should be an important lens for evaluation of emerging construction and smart home solutions. For example, concrete 3D printing has been promoted as a promising construction technology. Projects in China, UAE and Netherlands have received much press and attention. However, 3D printing of buildings may be following a dead-end branch of construction technology evolution because it operates within the legacy framework of permanent buildings. One important constraint in the transition toward reusable and reconfigurable buildings, it appears, would be cultural, rather than purely technological. The image of buildings as timeless fortresses, even if numbers suggests otherwise, is too ingrained in the Western culture (in Japan, for example, cultural attitude is different, and it’s acceptable to design buildings with a relatively shorter useful life). Therefore, design of reusable and reconfigurable building should ensure that at any given moment in time they permanent.